Executive Chef Shares How To Make Healthy Eating Easy (and Fun)! Who says healthy eating has to be boring? Executive Chef, Craig Hamilton, from The Village at Penn State takes the bland out of healthy and replaces it with flavor, comfort, and joy. When people eat the food that Chef Craig and his team at The Village cook, their taste buds thank them, and so does their health. According to the United States Department of Agriculture (USDA), eating a diet rich in vegetables and fruits as part of an overall healthy diet may reduce your risk for heart disease, heart attacks, and stroke. Eating a diet rich in high-fiber foods may reduce the risk of type 2 diabetes, heart disease, and obesity. Eating foods rich in potassium as part of an overall healthy diet may lower blood pressure and reduce the risk for kidney stones as well as decreasing bone loss. Reducing your sodium intake may help control or improve certain medical conditions like kidney disease, high blood pressure, and heart disease. The way we eat affects our health in a variety of ways. When we don’t get the proper nutrients in our diets, our bodies suffer the consequences. To find out what nutrients you should be getting in your diet read our blog post on proper nutrition by clicking here! Chef Craig’s healthy eating tips are simple: fresh is best. “I’ll take fresh and local any day,” Chef Craig states adding that residents will agree. Chef Craig’s tips for healthy eating consist of staying away from processed foods, keeping sugar and salt to a minimum, and avoiding too many heavy carbohydrates. He recommends eating whole, fresh foods as these generally contain the most nutrients. For Chef Craig, good food has always been his passion. Growing up in the kitchen cooking beside his mother and grandmother, it’s no surprise he saw a future in the culinary world. Now, his career as an Executive Chef at The Village is more rewarding than ever. “I’ve been with The Village since day one, nearly 15 years,” he says. Chef Craig explains that The Village offers a wide range of menu items, serving everything from fine dining, to comfort food, and any recipe their residents know and love. Plus, they always keep the health needs of residents in mind. “Serving healthy foods is very big for us when we create our menus,” Chef Craig explains. Whether it’s adjusting the menu every night, or making last minute changes, if residents at The Village request it, Chef Craig and his team do everything they can to accommodate their health and nutrition needs. To see what’s cooking at The Village and discover more excitement behind this university-based retirement community, click here to visit their website. The Becoming Center is more than just a place where individuals come to reach their health and fitness goals, it is the core of motivation for people striving to feel strong, and discover the endless possibilities of living well. An outstanding wellness center located in Montgomery County, The Becoming Center is home to exercise physiologists, personal trainers, and nutritionists who create personalized health and exercise programs on a daily basis. Today, they’re sharing their secrets on how older adults can lead a healthy lifestyle, lose weight, and live well. Why does it feel so difficult for older adults to lose weight? According to the Centers for Disease Control and Prevention (CDC), in 2015-2016 the prevalence of obesity was higher among adults ages 60 and older than it was in younger adults ages 20 to 39. With older adults representing approximately 41 percent of the obese population in America, and individuals ages 20 to 39 representing just 35 percent, the question isn’t whether or not obesity is more common among this population, it’s why. Exercise Physiologist at The Becoming Center, Kiley Sharp, says, “Several things change in the body with age, including metabolism slowing down and typically several health issues and concerns. As individuals age, it is not uncommon for health problems to surface, which can often make exercise and nutrition difficult to maintain and keep up with.” To stay physically active and maintain a healthy weight, older adults must navigate these new challenges, and The Becoming Center personal trainers are spilling their secrets. 1. Find a fitness routine you actually enjoy doing! If you’re trying to lose weight, exercise will certainly help. But the key to making physical fitness more routine is making it feel fun, not dreadful. According to the US Department of Health and Human Services, only 35-44 percent of adults 75 years or older are physically active. And more than 80 percent of adults do not meet the national guidelines for physical activity. These numbers are certainly concerning, and they likely say a lot about how Americans feel about exercise overall. Exercise physiologist, Kiley has a simple recommendation, “Every individual’s body is different and what it really comes down to is finding something that is effective for that person and also finding something that they enjoy and are likely to stick to!” Kiley says, revealing in her opinion a key component to creating effective fitness routines. It’s an accomplishment to successfully fit exercise into your day-to-day. However, if you’re looking to lose weight, it’s important to know what kinds of exercise will be most effective in relation to your fitness goals. Kiley, who works with many older adults says, “With clients, I have found that a balance between cardiovascular exercise and resistance/weight training seems to be the most successful way to lose weight.” Recommending variation and balance, Kiley advises many of her older adult clients that focusing on both muscle building and cardio is more beneficial than simply focusing on one or the other. According to Dr. Medha Munshi, geriatrician and endocrinologist at Beth Isareal Deaconess Medical Center in Boston, muscles use up more calories than fat, so the less muscle mass you have, the slower your metabolism will typically be. As a result, the slower your metabolism is, the fewer calories you will need. This is why a balanced fitness routine of both weight training and cardio is so important to burn calories and build muscle simultaneously. 3. Don’t forget about nutrition. Exercise is certainly important when you’re trying to lose weight, but equally important is the nutrition you pair alongside it. Diet along with exercise is what will make your weight loss efforts most effective. According to Dr. Holly Lofton, M.D., assistant professor of medicine and director of the weight management program at New York University’s Langone Medical Center, to lose one pound each week from exercise alone (without dieting), you’d have to run 10 miles every day. As unrealistic as that is for the average human, it demonstrates the need to balance both fitness and nutrition for optimal weight loss. While health issues can often make exercise difficult for older adults, personal trainers at The Becoming Center strive to help members reach their fitness goals through safe and effective exercises. “At The Becoming Center, our main priority is safety,” Kiley says emphasizing that even with health issues, it’s possible to maintain your physical activity and weight. Kiley says a challenge many of her clients at The Becoming Center face is accountability. “Typically when exercising alone, it is difficult to hold yourself accountable and it’s common for a person to plateau or even regress and stop their routine.” Kiley says this is why personal training is so important for the older population. “It helps to ensure that individuals are keeping their schedule and working toward their goals with someone that can hold them accountable.” While it can be difficult to find motivation to exercise on your own, if someone else depends on you, particularly a personal trainer, it makes motivation a little easier. At The Becoming Center, personal trainers like Kiley work with members to create customized fitness routines that accommodate your health needs in a safe and effective way. Training sessions can range from strength exercises, to balance, to stretching, and more. With a diverse array of programs and established team of personal trainers, exercise physiologists, and nutritionists, The Becoming Center helps adults of all ages become stronger and healthier every day. Click here to visit their website and see how they can help you reach your nutrition and fitness goals. On Sundays, residents at The Village at Penn State are greeted warmly at the omelet station by Ali Dajani. While making their favorite omelet, he talks with each one about whatever’s on their mind. That’s usually the previous day’s football game (or not depending on how well Penn State played). Ali began working at The Village through a program called the State College Area High School (SCAHS) Work Experience Program. The Village first learned about the program several years ago when another employee who attended SCAHS realized that, with the hours she was working, she could qualify for the program. In the 2017-2018 school year, SCAHS awarded The Village with their Employer of the Year Award. The program has done so well that last year The Village hired five students. For students like Ali, they not only get the work experience, but many develop a love for the industry and pursue a career in hospitality and culinary arts. Ali is currently a freshman at Penn State majoring in hospitality management. He has aspirations of continuing on to culinary art school. And how do the people who call The Village home feel about having high school students working there? Duane shared that the feedback on surveys has been very positive. They love having youth around. While students often feel intimidated at the beginning, they quickly become friends with many of the residents. Some of those friendships even continue to thrive long after the student has left The Village to pursue a career elsewhere. Discover senior living at The Village at Penn State. Experience our fun and spirited community by clicking here. It’s easy to fall behind in attaining your fitness goals, especially during times of inclement weather. And finding ways to exercise indoors that doesn’t involve heavy gym equipment or a treadmill can feel nearly impossible. Aquatic exercise is not only an excellent alternative for those looking to spice up their indoor workout routine, but it is especially effective for people living with arthritis. For individuals who experience painful symptoms like stiffness and joint pain, water aerobics and other water activities are a great way to get your heart rate up without causing damage or stress to your joints and muscles. According to the Arthritis Foundation, arthritis is the leading cause of disability among adults in the United States. There are currently more than 100 different kinds of arthritis in which the symptoms for each may vary. The most common joint symptoms are swelling, pain, stiffness, and decreased range of motion. While symptoms may range in both pain and severity, the effects they have on your body may prompt you to change certain aspects of daily life, including your fitness routine. Exercise, while essential to every person’s health and well-being, is especially important for individuals with arthritis. Painful symptoms like joint pain and stiffness may cause people living with the disease to shy away from working out. However, exercise for arthritis can actually increase strength and flexibility around the joints, reducing the pain you experience from symptoms. For people living with arthritis, physical activity is critical to maintaining the severity of symptoms as a person’s body weight contributes to the amount of stress put on their joints. In fact, according to Eric Matteson, MD, chair of the rheumatology division at the Mayo Clinic in Rochester, Minnesota, every pound of excess weight a person carries around exerts approximately 4 pounds of extra pressure on their knees. So, for a person who is just 15 pounds overweight, their knees carry an extra 60 pounds of pressure on a daily basis. That can feel tiring and painful on anyone’s body, but it feels especially discomforting for a person struggling with joint pain from arthritis. Exercise can help individuals with arthritis maintain a healthy weight and eliminate any extra pressure on their joints. What are good exercises for arthritis? You’ll want to consult your doctor about exercises for arthritis that are best for your specific diagnosis. You should aim to participate in types of physical activity that have minimal impact on joints and work to strengthen the muscles around them. Range of motion exercises, strengthening exercises, and aerobic exercises are all low-impact workouts excellent for individuals with arthritis to maintain their physical activity. One aerobic exercise in particular that is found to be especially beneficial for people with arthritis is water aerobics. Water aerobics is a great way to get your heart rate up while keeping stress on joints to a minimum. Water has greater resistance than air so jogging in a pool can often exert more energy and burn more calories than jogging on land, while reducing the amount of impact put on joints. The Manor at York Town, a premier independent living community located in picturesque Bucks County, is the perfect place to kick start your workout routine and reach your fitness goals. With an engaging wellness center full of state-of-the-art equipment as well as an indoor heated pool and Jacuzzi spa, fitness at The Manor becomes exciting and inspirational. “Staying active is essential for older adults. At The Manor, our goal is to provide as many opportunities as possible to maintain the health and wellbeing of our residents so they can enjoy retirement,” says Robyn Fine, director of community life at The Manor. Robyn sees firsthand the beneficial impact The Manor’s wellness programs and facilities have on residents. With access to personal trainers who can design personalized exercise programs, and post-rehab functional exercises, as well as fitness evaluations and nutritional consultations, residents are empowered to live healthfully and maintain their physical activity. Resident at The Manor, Carol Axler, is proud of her fitness routine and takes full advantage of The Manor’s exercise programs, including their indoor heated pool. “Every morning at 7 o’clock until 7:30 I start my day by working out on the fitness equipment. Then, I go into the Great Room, where we have exercise class from 7:30 to 8:00, and then from 9:00 to 10:00 I participate in water volleyball,” Carol explains, outlining an exercise routine that puts even most young people to shame. For Carol, physical activity has always been important, and The Manor’s wide array of fitness programs opened her mind to new and exciting possibilities. “I had never played volleyball before coming to The Manor. I really got into it once I moved in. 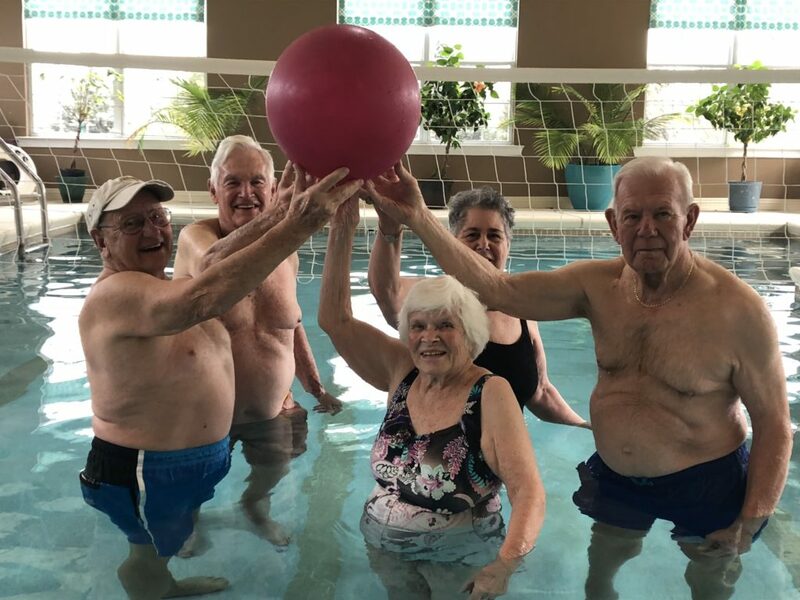 Water volleyball provides a different way of exercising,” Carol says about trying water volleyball for the very first time in The Manor’s heated indoor pool. Now, Carol plays on the water volleyball team that meets three times each week. If you want to hear more about Carol’s experience with The Manor’s wellness programs and fitness facilities click here for her story. Or, if you want to experience the benefit of exercise and learn more about independent living communities, see what living healthfully and happily at The Manor at York Town can do for you.